Tickets for OTEP VIP - Nantes, France in Nantes from National Acts Inc.
***Neither OTEP nor National Acts have any affiliation with the venue the band is performing at. The VIP packages are done specifically through National Acts on behalf of the band. The venue usually has no details of the VIP packages the band is offering. Therefore, any questions regarding your VIP Package should be directed to National Acts HERE. Any questions regarding set times, other bands on the bill, age restrictions, directions to the venue, etc need to be directed to the venue. ***From time to time the items in the VIP Package sell out. 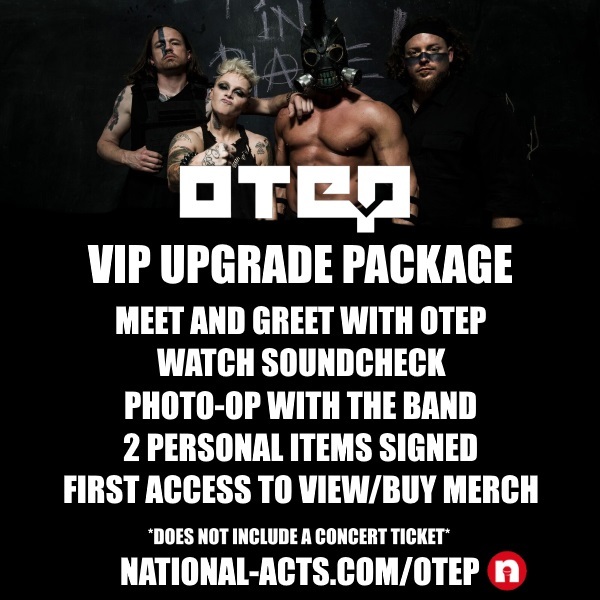 OTEP reserves the right to change the contents of the VIP Package at any time based on availability. Not receiving certain items in the listed package does not entitle you to a refund or a discount.